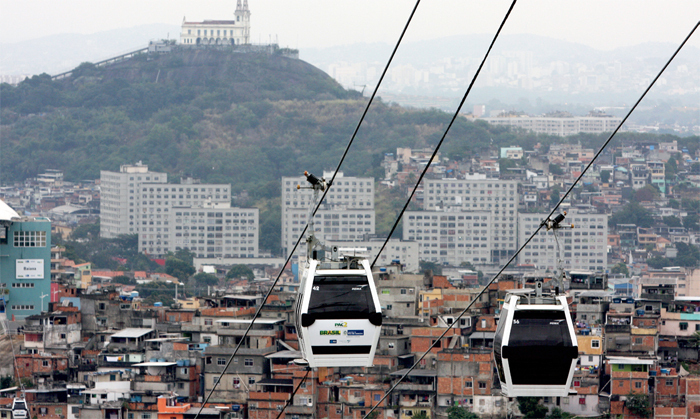 Gondola lift, Complexo do Alemão, Rio de Janeiro, July 7, 2011. Photo: PAC2/Flickr. 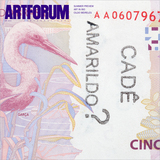 FOR THIS ISSUE’S Dispatch, Artforum goes south, to Rio de Janeiroa city as defined by myths of sensualist extravagance as it is by horror stories of yesterday’s military dictatorship and today’s slum violence. Yet one does not have to subscribe to cliché to recognize that Rio is somehow singular; that, in the past half century alone, it has been a place of extraordinary innovation and devastation alike, from the decadent inventions of bossa nova and Tropicália to the human-rights abuses of the postwar period and the unsettling rise of the modern favela in the 1970s. Such paradoxical histories are still with us: This year, as Rio prepares to host the World Cup in June and gears up for the Summer Olympics in 2016, spending astronomical amounts on infrastructural changes and in many instances attempting to eradicate portions of the favelas, it also observes (without celebrating) the fiftieth anniversary of the 1964 coup that brought the military to power. Enormous protests not seen since the mid-’80s demonstrations marking the end of the ensuing dictatorship have spread throughout Brazil in response to shocking economic disparity and public expenditure that disproportionately benefits the wealthy. And yet, in spite of this unrestor perhaps because of itnew cultural forms, new aesthetics, and new ideas are appearing all around. In the pages that follow, Artforum takes stock of this roiling scene: Scholar GUILHERME WISNIK looks at ambitious urban development plans transforming the unique topography of the city; critic SÉRGIO B. MARTINS reflects on the new Museu de Arte do Rio’s ambitious cultural initiatives; art historian IRENE V. SMALL charts artists’ and activists’ unprecedented investigation of surveillance, documentary reportage, and social networks; and curator CHRIS STULTS examines filmmaker Eduardo Coutinho’s lifelong chronicling of Cariocas’ intimate realities. Finally, Brazilian artists TAMAR GUIMARÃES, RENATA LUCAS, and DANIEL STEEGMANN MANGRANÉ limn their work’s relation to the city’s cultural and architectural legacy. Recalling the carnal, neo-Concretist explorations of artists such as Lygia Clarkwhose oeuvre is currently on view in a retrospective at the Museum of Modern Art in New York (through August 24)their work engages the tactile and bodily experiences of today as they are lived and mediated, inside Rio and out.